Ranch dressing is one of those things that I could, and would, put on everything. It’s creamy, it is full of flavour, what’s not to love? 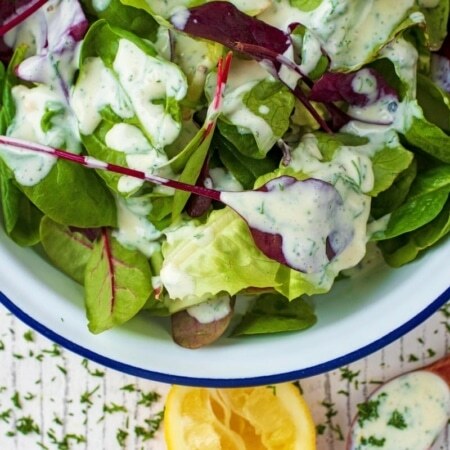 We have lightened this usually calorific dressing by using Greek yoghurt, but it still packs plenty of flavour. It’s so easy to make and stores in the fridge for a couple of days. When I was travelling round the US a few years ago, I was amazed by the variety of salads on restaurant menus compared to what we have here in the UK. They pretty much all came smothered in ranch dressing and I fell in love, as ranch was not really a big deal here in the UK. I came back from that trip quite a few pound heavier (who knew salad could make you gain weight!) and wanting to recreate my favourite salads from that trip, but in a healthier way. 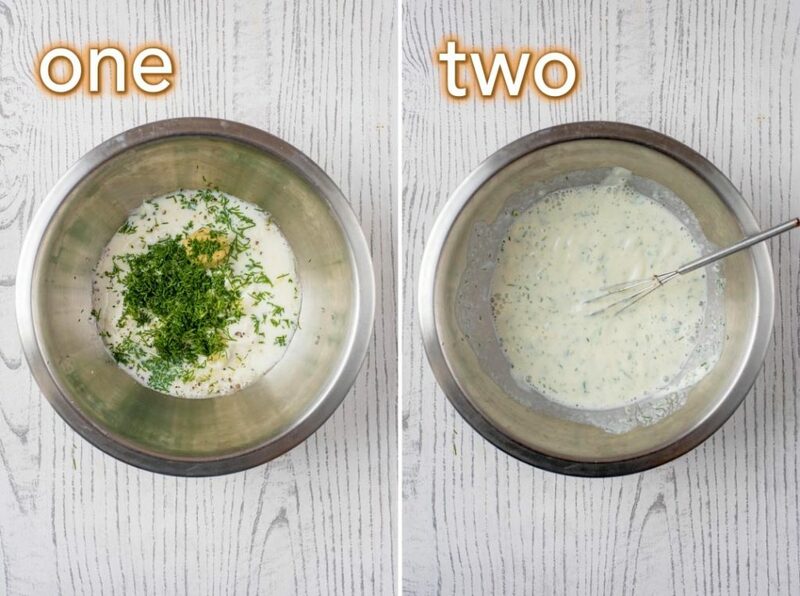 We try to make our own dressings as often as we can (when time permits), because they really do only take a few minutes and they need minimal ingredients. Next time you are in a supermarket, look at the label of a salad dressing bottle. It’s really long, and it really doesn’t need to be. Just a few fresh ingredients and you have yourself a delicious and light salad dressing. How did we lighten up this ranch dressing? I used Greek yoghurt of course – did you expect anything else from me? 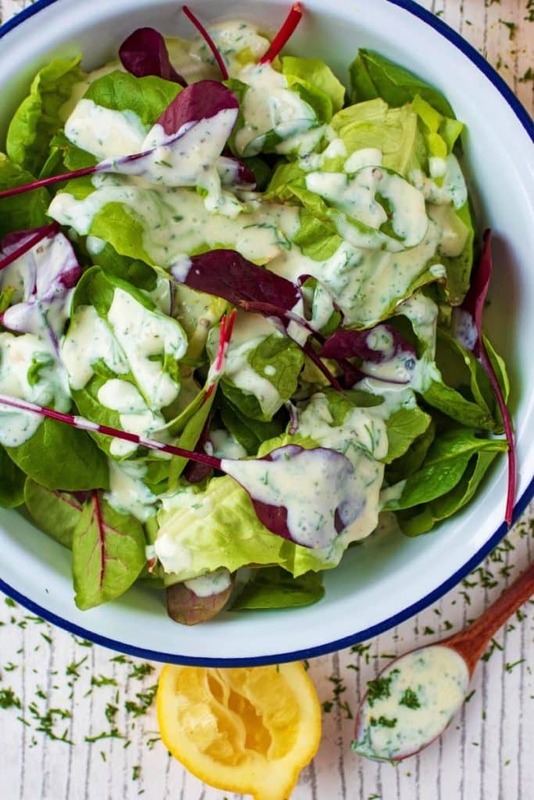 Ranch dressing is usually made with sour cream and mayo, which obviously tastes amazing, but can really make a salad high in calories. If you really don’t like the taste of Greek yoghurt (bear in mind that this tastes different from plain Greek yoghurt), then feel free to use a mixture of yoghurt, mayo and sour cream, but remember it will change the nutritional value a lot. Want a vegan version of this? Swap the Greek yoghurt for a soya yoghurt and use oat milk instead of skimmed. It won’t quite have the same flavour, but it’s a great vegan alternative. One: Put all of the ingredients in to a bowl. Three: Serve in a dressing bottle. Store in an air tight jar and it will keep for about 4 days in the fridge. You can make this vegan by using soya yoghurt and oat milk. Add a little onion flavour by mixing in some fresh chives. This dressing makes a great dip for chicken wings. 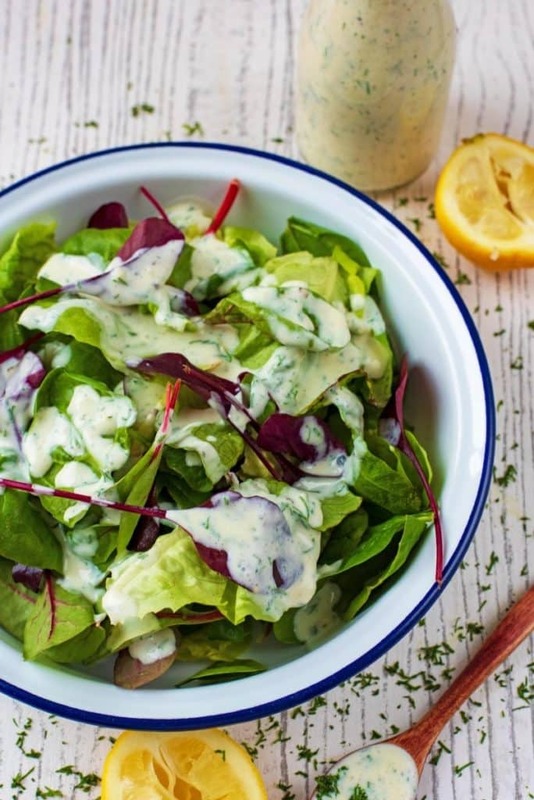 Do you want to be kept up to date on more delicious posts like this Healthy Ranch Dressing? Please subscribe to the blog mailing list (it takes 30 seconds). 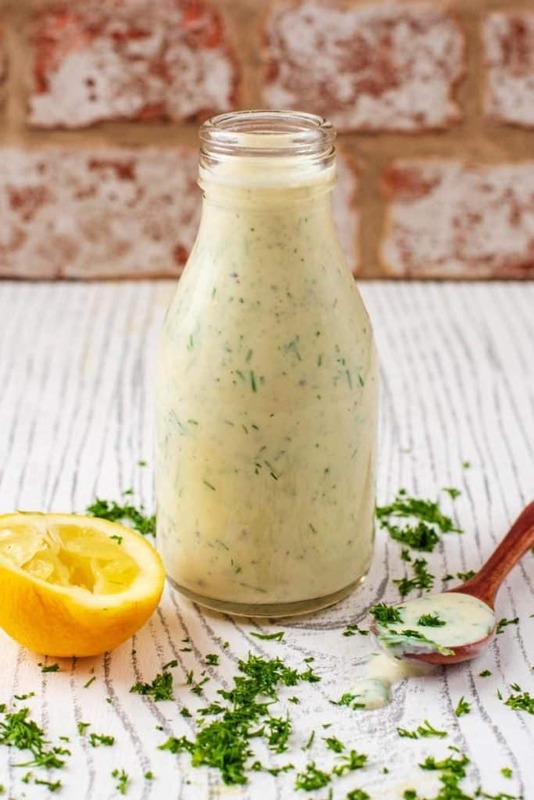 If you’ve tried this Healthy Ranch Dressing, or any other recipe on the blog, then let us know how you got on in the comments below, we love hearing from you! You can also FOLLOW US on FACEBOOK, TWITTER, INSTAGRAM and PINTEREST to see more delicious recipe ideas, behind the scenes shots and also what we are getting up to. 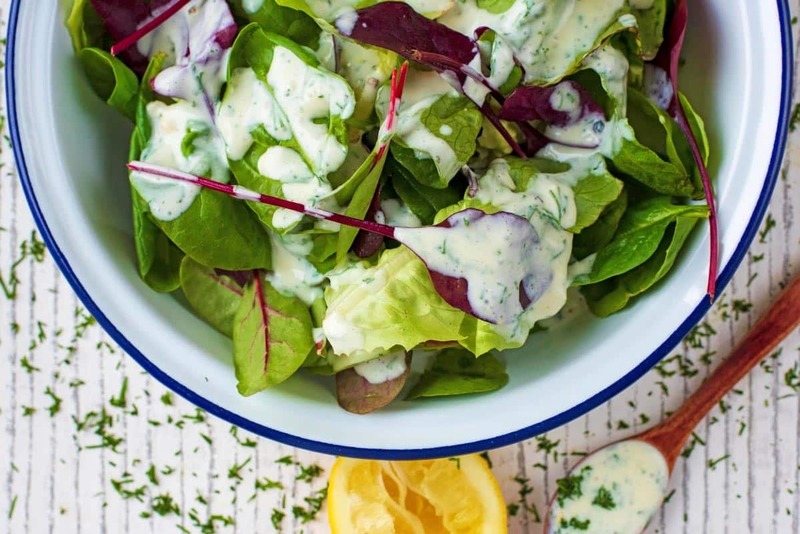 We have lightened this usually calorific Ranch Dressing by using Greek yoghurt, but it still packs plenty of flavour. It's so easy to make and stores in the fridge for a couple of days. Put all of the ingredients in to a bowl. Serve in a dressing bottle. 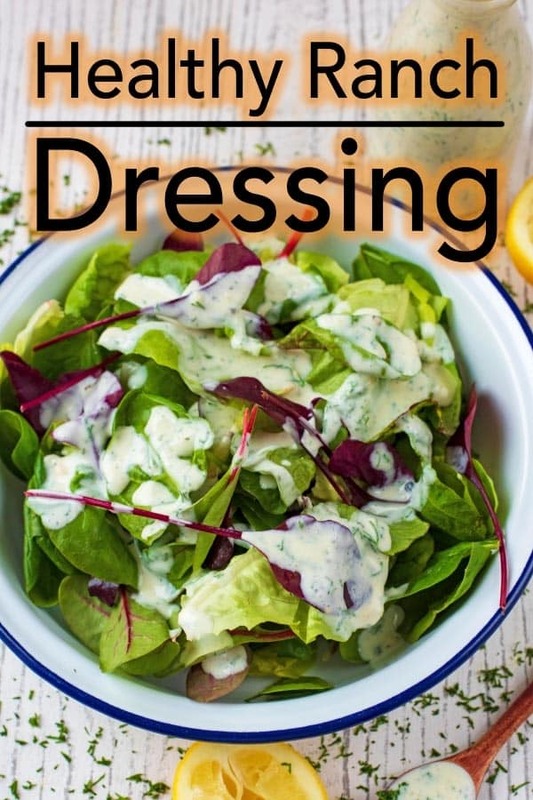 I love to make my own dressings and this one turned out perfect! I really like the taste of the dill in it, will be making again! I am so glad you enjoyed it. The dill is really nice in it isn’t it. This sounds delicious and so easy. I’ll be giving this a try, as well as your Ceasar dressing (my recipe is similar, mostly just have to swap mayo for greek yogurt). Thanks! I would love to see a healthy blue cheese dressing- shop bought ones are so heavy and full of rubbish! I’ve always wondered what Ranch dressing actually is. I’d be adding some miso and soy to it!